SKY TV New Zealand has built a statue of King Joffrey that Game of Thrones fans can destroy with their Tweets. In a fantasy world full of not so nice people, Joffrey Baratheon is pretty much the king of the jerks. A spoiled sadistic monster masquerading as a human being, pretty much everything he says and does in the series oozes malicious venom. Regardless of whether you're talking the books or the show, there probably isn't a more universally loathed character in the whole of the franchise. 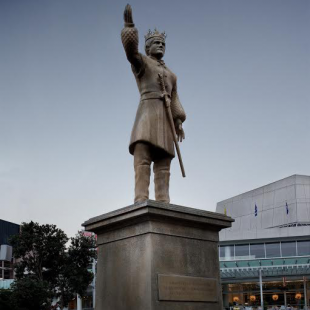 That in mind, you might wonder why the New Zealand town of Auckland recently installed a statue of the boy king. According SKY TV New Zealand, the answer is to pull it down. In an email, the company explained that a "medieval winch" has been attached to the statue "with a rope around Joffrey's neck." Every time a fan Tweets with the hashtag #bringdowntheking, the winch will pull the rope slightly tighter. This will continue until the statue is finally pulled down. To make the final fall viewable around the world, SKY TV has also installed a pair of cameras that fans can use to watch the statues downward progress in real time. All of this is, of course, being done to help promote the impending premiere of Game of Thrones season four. With the show set to begin anew on April 6th, we'll be interested to see if the statue still stands or if the collective hatred of the world's Twitter users will be enough to bring it down by Sunday.